Worshipful Vaishnavite poet Acharya Sri Nammazhwar in his Mangalasasanam Hymn says, If we seek asylum in Him, He will be our protector, Devas will be good to us, if and when we reach him to escape the threats of the demons, He would appear before us, so let’s ever chant the name of Lord of Tirumogur. 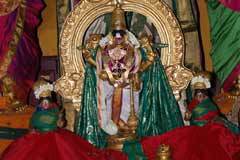 10 day Vaikasi Brammotsavam (May-June), Vaikunta Ekadasi (December-January), Gajendra Moksham in the Masi Poornima day in February – March, 2 day Panguni Thirukalyanam (March-April), Krishna Jayanthi are the main festival observed in the temple. Also all new moon days, both Tamil and English New Year days, Deepavali and Pongal are the festival days in the temple. 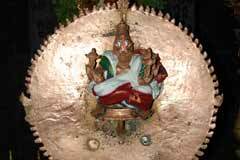 Sudarsanar (Chakkarathalwar) has 16 hands with 16 weapons, rolling feet and the idol bears holy mantra letters. This is the only temple where Sudarsanar has all these special aspects. Though there are Sudarsanar shrine in other famous Vaishnava temples as Srirangam, Kancheepuram and Srivilliputhur, this is the only shrine where He appears with such holy letters. Behind the Chakkarathalwar is Yoga Narasimhar known as Narasimha Sudarsanam. The shrine is very famous as the expectations of the devotees for business development and marriage alliances end in success. 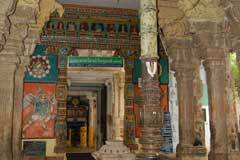 The temple is opened from 7.00 a.m. to 12.00 a.m. and 4.00 p.m. to 8.00 p.m.
Sri Kalamegaperumal temple, Thirumohur-625 107, Madurai Dist. Abishek (bathing) Chakkarathazhwar in curd is a very important prayer commitment. Devotees offer clothes to Perumal and Thayar (Mother Goddess) and also apply butter. People also offer garlands made of Tulsi and other flowers. Prasads – Nivedhanas are prepared, offered to the lord and distributed to the visiting devotees. Those who could afford do Annadhanam (feeding) to the visiting devotees and the poor. The Ksheerabthi Nathar and Mother in the shrine are in a praying pose before the presiding deity and this is known as Prarthana Sayanam. 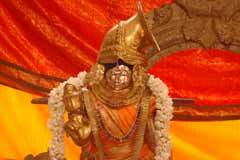 Chakkarathalwar: Sudarsanar (Chakkarathalwar) has 16 hands with 16 weapons, rolling feet and the idol bears holy mantra letters. This is the only temple where Sudarsanar has all these special aspects. Though there are Sudarsanar shrine in other famous Vaishnava temples as Srirangam, Kancheepuram and Srivilliputhur, this is the only shrine where He appears with such holy letters. 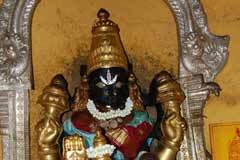 Behind the Chakkarathalwar is Yoga Narasimhar known as Narasimha Sudarsanam. The shrine is very famous as the expectations of the devotees for business development and marriage alliances end in success. During the churning of the milk ocean, the devas and the demons picked up a quarrel. 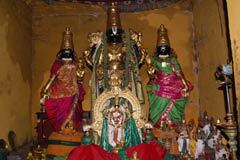 The devas went to the Lord and appealed for freedom from the demons. Lord Vishnu took the form of an enchanting woman and lured the demons and gave the nectar to the devas. Moham in Sanskrit means passion or desire. 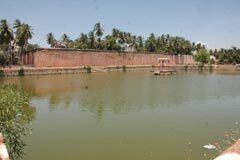 As Vishnu took the Mohini form, the place was known as Thirumohanavur, which later came to be known as Thirumohur. 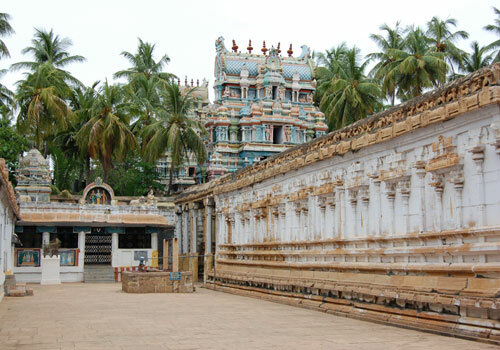 The great Vaishnavite saint Nammalwar prayed to all Perumals in the 108 Divyadesas, but Kalamegaperumal of this temple only took the Alwar to salvation. 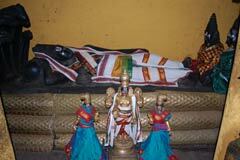 Hence, once a devotee prays to Kalamegaperumal in this temple, his /her seat in the other world – Vaikunta – is ensued. 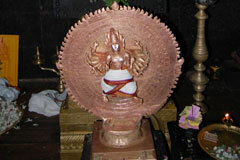 The Chakkarathazhwar is a powerful and graceful deity here. Tirumogur is 10 km from Madurai. Buses are available from Central and Mattuthavani bus stands. The temple is near the bus stop. Hotel Rathna Residency: +91-452-437 0441 – 2, 437 4444.